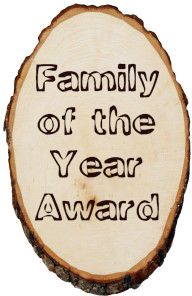 The Raven District Family of the Year award is presented annually to a family who has, as a group, supported the Scouting program in the Raven District. Oftentimes, a family participates at all levels of Scouting, from Tiger Cubs to Venture Scouts, both youth and adult. Those families that make Scouting a “family commitment” deserve to be recognized. For the purpose of this award, we use the definition of “family” offered by BSA: “any group of persons with whom a youth lives.” We, therefore, recognize the variety of family units that Raven volunteers experience. Families nominated for this award must have one BSA registered adult member. All such families in Raven District are eligible. Nominations may be made by any Scouter. Honorees are selected by the district awards committee and is presented at the Raven District Dinner. Briefly describe how each family member has contributed to the Scouting Program in the Raven District.